These places became major destinations for well traveled Greeks and Romans. 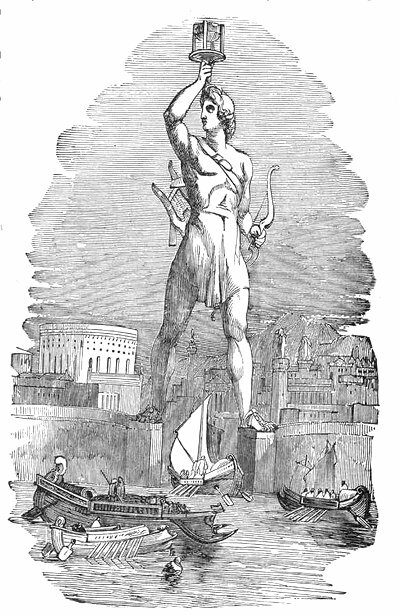 The Colossus of Rhodes was a large bronze statue of the Sun God Helios built in 282 B.C. to commemorate the defeat of a beseiging army from Macedonia. Rhodes was a Greek state on the Island of Rhodes in the Mediterranian. The Colossus had a stone pedestal 55 ft. tall, and the bronze skin was supported by an iron and stone inner structure. Only 56 years later the statue was toppled in 226 B.C. by a strong earthquake and lay in ruins for over 1000 years, when it was dismantled for scrap. The Rhodesians had the means to rebuild it, but an oracle advised against it. It was described by the Greek historian Pliny as standing 33m or 110 ft high. It stood on a 55 ft tall pedestal. When it fell, "few people can make their arms meet round the thumb." Even after it fell, it continued to be a travel destination for about eight centuries. Some depictions show the Colossus straddling an entrance to a harbor, but others believe Helios was in a conventional standing position. Most views show one arm raised, either shading his eyes or holding a torch. Its actual pose is unknown. This image is from John Clark Ridpath's History of the World, 1915. The Colossus compares pretty favorably to its modern equivalent, the Statue of Liberty. The Statue of Liberty is 151' tall, and stands on a 150 foot base, so the two statues were roughly comparable in size and separated in time by about 2000 years.